The results are finally in! After two weeks of voting, the Preliminary Stage of the PokéCommunity Trainer Tournament has finally concluded. Listed here are the full results and vote breakdown of the 16 Preliminary Stage rounds. For each trainer, the raw number of votes from Twitter and the number of reacts from Facebook were added together to form the total number of votes from both social media platforms. The trainer who got the most number of total votes advanced to the Semi-Finals. The trainer who got the second highest number of total votes was given a second chance, and advanced to the Wildcard Round. For ties, a tiebreaker vote was held in the Trainer Tournament thread in Pokémon General. This tiebreak lasted for 24 hours. If for whatever reason, there was still be a tie, the Social Media Team would decide collectively on who won the tiebreak. For this particular stage, there was a tie between Kiawe and Falkner for 2nd place, and Korrina and Pryce for 1st place in their respective rounds. Here are the links to our social media pages. 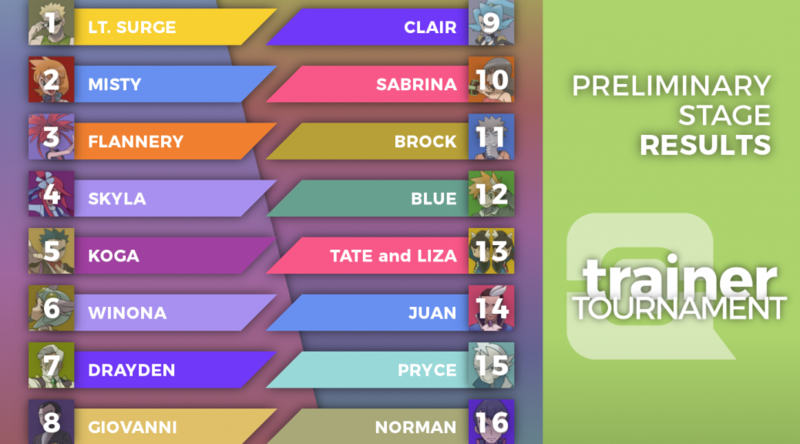 Make sure to follow us, so that you are notified on when the next round of the Trainer Tournament begins!